Cue Gundam Build Fighters: Battlogue. It advertised itself as this haven for Gundam dream matches akin to the immensely popular Death Battle youtube series. However, as the months went by, that itch started popping up again and we started feeling at least somewhat disappointed by this ONA and what it initially promised us. That is unfortunately this show's biggest failure, even if the action in general is still its biggest success. For example: episode 1 is mainly comprised of a simulation where Char Aznable from the Universal Century Timeline, and Ribbons Almark from the Anno Domini Timeline. Both of them operate new machines based on their canonical mobile suits, and this is what we had been wanting all along. Unfortunately, the next 4 episodes all starred Build Fighters characters either battling one another or alongside each other, battling a Perfect Grade Exia (which incidentally marks the first Perfect Grade kit to be featured in the franchise), or weirdly enough, two characters becoming SD Gunpla Bear Magical Girls. The worst part is that these episodes were released monthly, and we only had 5 of them. Just imagine how incredible it would have been do dedicate an episode to a battle between Hiro Yui from Gundam WIng vs Setsuna F. Seiei from Gundam 00, or Kamille Bidan from Zeta Gundam vs Shinn Asuka from SEED Destiny. The possibilities were endless! We could have had episodes like these on occasion (particularly episode 4) to sort of break that up and offer something different on occasion, but understandably, we do feel at least a little cheated, given that the rest of the ONA felt like a bait and switch for he sake of solidifying that this is still a Build Fighters show when it could've easily been Build Fighters characters introducing or even tinkering with these match-ups like in episode 1. Not to mention it also serves as a reminder to many just how annoying and childish the Try characters are (especially given how the actual child characters from the original were more mature), even if we do still get to spend more time with some of the infinitely ore likable Build Fighters characters such as Sei, Kawaguchi, and especially Rinko. Even the Renato brothers are fun, especially with how episode 4 ended. However, the fights we got were still pretty fun to watch, like the Char vs Ribbons fight in episode 1, and the Renato brothers vs Exia and other 00 Units in episode 4. However, the fights certainly aren't as well-animated or as flashy and pulse-pounding as in the original seres, where the sheer impact of the attacks and the emotions and situations of the characters made every battle feel as climactic as a major battle in some of the better Gundam series. A few bad moments aside, these are still fun battles with a few cool new designs, mainly the two Gunpla that battle in episode 5. As a side-note before wrapping things up, the music doesn't have any new additions barring the decent ED and the small track that plays at the beginning and at the teaser post-credits. So while we were robbed of the itch-scratching we craved involving these dream matches this show advertised to us, we still got to see some enjoyable battles unfold, for better or worse. It was a bit of a disappointment though, and having some of the old characters back doesn't really fix the issue. It was, if nothing else, an interesting and unique entity in the franchise. Unfortunately, GM no Gyakushuu is without a doubt, the superior of the two main Build Fighters projects that came out this year, if partially because it stuck with what it promised us all the way through. Many, if not most, gundam freaks have their own gundam(s) inside their imagination. Gundam Build series help us that, by freeing our imagination far and wide inside gundam universe. This concept is very spectacular, especially for gundam freaks, it's kind of heavenly. But concept doesn't always executed properly. Gundam build series anime fall exactly at this point. Except this one title : Battlogue. GBF Battlogue is all about gundam battle in a particular setting. So there's only thin story, except the story of battle itself - if we can call that a story. Despite its thin story, the quality of that story speaks quite well. Each episode has their own story, most are little expansions of stories from GBF anime season 1 and 2. That is a good thing, even more so because it's written with consistency. Another aspect of story that Battlogue has a very high point is the references for Gundam universe. In such a short episode, there are some (if not many) references shown to please gundam freaks. Dig it deep, swim in the gundam universe, and we'll know how to appreciate those references. Another pleasant thing in Gundam Build series is the strong feel of "shounen" vibe. Im not talking about flashiness here, but a feel that make our heart trembles in excitement. It makes our heart unrest with such a joyful flame inside. The battle animation surely gives us this vibe, but the musics amplify this vibe by leaps and bounds. The musics have such a strong nuance of shounen and very fit to the battles shown. One can't help but feel "something is very lacking" when watching gunpla battle without a proper music. But nothing to worry, Battlogue gave us the best for this aspect. To conclude this review, GBF Battlogue is the best Gundam Build series ever, because it could execute the concept very well. Im well aware that we can't fully see this title as a separate thing from GBF season 1 and 2, but nevertheless it has different title and the quality differs greatly from the previous seasons. 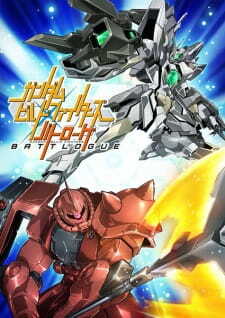 For Gundam Build fans, it's recommended to watch Battlogue as a pretty nice, closing, after-taste from season 1 and 2.